Recently, one of my friends noted I had used a familiar name or two from where I once lived in Ohio. She thought it quite clever of me, but I explained this was a common practice with authors. In fact, most of my “author” friends have told me of their naming characters and places after people they know. I, for example, named Chadwick Harrison from Darcy’s Temptation after Chad Pennington, the former NFL quarterback. Pennington showed a great kindness to my son while my mother lay dying. Clayton Ashford from the same book comes from Clay Aiken and my former principal at Parkwood High School. Kim Withey, a regular follower on this site, found her name used for the villain in The Phantom of Pemberley. My son’s godmother is married to a man named Epperly. In The First Wives’ Club, Nathaniel Epperly is Lord Eggleston. While I was writing The Mysterious Death of Mr. Darcy, I was watching Tamara Drewe on a cable channel. A character I introduced in the chapter therefore became Nicholas Drewe. I met a young man at an Enterprise Rental Car outlet in Monroe, North Carolina. His name was Brantley Fowler. I told him I intended to “steal” his name for one of my characters. Bran is matched with Velvet Aldridge in A Touch of Velvet. Velvet is named for a former student – a young lady who was beautiful on the outside, as well as being a compassionate and loving individual. In The Scandal of Lady Eleanor, James Kerrington is Lord Worthing. My son attended school in Worthington, Ohio. 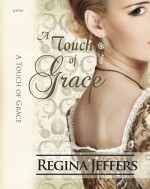 Gabriel Crowden, the hero of my Regency romance, A Touch of Grace, is the Marquis of Godown. In the Worthington area, Godown Road is a regular cut through between major thoroughfares. (We often called it “God own”-ed.) I have been known to open the newspaper or to switch to a news channel in search of an interesting name for my characters. From my local news stations, I have had minor characters named Wickersham, McGinthy, and Troutman. Occasionally, I choose a name that is indicative of the name’s meaning. “Aoife,” the heroine of His Irish Eve, is so named because “Aoife” is the Anglicized version of “Eve.” She is the “Eve” to “Adam” Lawrence, one of the main characters in The Phantom of Pemberley. This novel is a continuation of Adam’s life after Phantom. Likewise, in my Christmas tale, Christmas at Pemberley, “Mary Joseph” is a major influence on Elizabeth Darcy’s life. She is the “Mary” from the Biblical tale. From The Disappearance of Georgiana Darcy, one finds such names as “Dolina,” which comes from the Scottish Gaelic Dolag, which means “world ruler,” an apt name for the villain of the tale. Even the last name “MacBethan” was chosen to meet several requirements of the story line. First, “MacBethan” is a derivative of “MacBean.” As I wished the MacBethans to be related to the infamous Sawney Bean, that was important. Secondly, “MacBean” is a patronymic name that comes from the Gaelic and means “life.” As “life” is in short supply in the MacBethan household, it seemed more than appropriate. So, based on my assumption from above, what is the possibility that our beloved Jane Austen used famous names or those she parlayed from the local newspapers in her stories? Could Mrs. Reynolds in Pride and Prejudice have come about because Jane read a piece about the famous artist Joshua Reynolds? There was, for example, a real life George Morland, a man known for his paintings of rustic scenes. Was he the source for Catherine Morland’s name? Could William Hodges have lent his name to Emma Woodhouse’s housekeeper? Hodges is best known for his paintings of exotic locales, especially those he visited while accompanying James Cook on the captain’s second voyage to the Pacific Ocean. Also in Persuasion, one finds Sir Walter openly declaring that Frederick Wentworth was “[q]uite unconnected; nothing to do with the Strafford family.” One must recall in her early History of England, Austen defended Thomas Wentworth, the first Earl of Strafford and the architect of Charles I’s design for absolute government. In fact, scholars have traced the Strafford connection to Austen’s novels. It shows that in the 13th Century Robert Wentworth married an heiress named Emma Wodehous. Coincidence? Also, when Austen and her family stayed at Stoneleigh Abbey, after her father’s death, she used what she learned from the journey in her novels. Stoneleigh and its ancestral history does resurface in her novels. Some of her characters are named after Leigh family connections, such as Willoughby, Woodhouse, Wentworth and Osborne. In Mansfield Park the description of the fictitious Sotherton Court has many resonances of Stoneleigh Abbey, including details of the chapel, grounds and nearby village with almshouses, and Northanger Abbey is set in an old abbey which has become a country home, like Stoneleigh which was founded in 1154 by Cistercian monks. One of the things that I often found ironic in Austen’s novels is the number of “Whig” names she used: D’Arcy, Fitzwilliam, Dashwood, Wentworth, Woodhouse, Watson, Brandon, Churchill, Russell, Steele, and Bertram. Could our dear Jane have spent time with her nose buried in the Peerage of England? For a Tory daughter, she certain gave the Whigs prominence! For a more in-depth study of these names, please visit, Janine Barchas’ “Artistic Names in Austen’s Fiction: Cameo Appearances by Prominent Painters,” Persuasion. 2009. Volume 31. 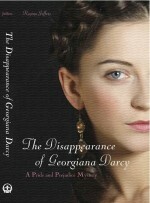 This entry was posted in Ulysses Press, White Soup Press, writing and tagged "His Irish Eve, A Touch of Grace, A Touch of Velvet, character names, Christmas at Pemberley, Darcy's Temptation, The Disappearance of Georgiana Darcy, The First Wives' Club, The Mysterious Death of Mr. Darcy, The Phantom of Pemberley, The Scandal of Lady Eleanor, Ulysses Press, White Soup Press. Bookmark the permalink. And I was thrilled,Regina, when reading the Realm series to find Mr. Shadwick and one of their magistrates of finance! Thank you for including our name! I never forget my friends.